Fifty Cadets from the Panther Battalion recently earned their CPR Certification from the Emergency Medical Consultants Company. Cadets received training over a two day period including Infant, Child and Adult CPR and Choking. They also conducted hands-on training with Automated External Defibrillators (AED) which use a controlled “shock” to help restore a victim’s heart rhythm. The Panthers closed out their training with a hands-on and written final exam to earn their two-year certification cards. 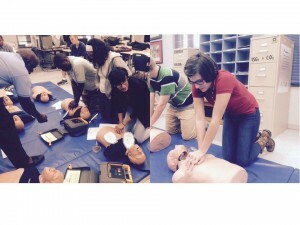 The training was part of an eight-week first aid course presented during the second semester of their JROTC course. (Left to Right) Cadets Jacob Ragin, Lyndsay Stanford, Hannia Antonio and Kali Owens practice their chest compressions as part of their CPR Certification course.